Update: The CHP says it was a 17-year-old teen who stole a Pontiac car from the Mid-State Fair lot and crashed into a Ford Explorer. Prior to the collision, two CHP officers at the fair grounds were alerted to the vehicle theft and tried following the stolen vehicle as the teen was driving away. The teen saw the patrol vehicle and quickly accelerated through the intersection at Spring and 16th streets, causing the collision, according to the CHP. Officers booked the teen in juvenile hall on a variety of charges, including felony DUI, grand theft of a vehicle, felony hit-and-run, driving on a suspended license and resisting arrest. 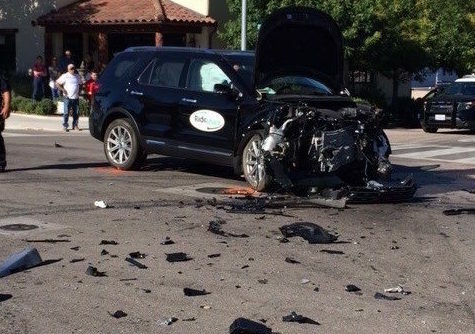 Original: An intoxicated teen stole a car from the Mid-State Fair parking lot and then slammed it into an SUV in downtown Paso Robles, sending the other driver to the hospital, according to the Paso Robles Police Department. Around 5 p.m., the suspect stole a Pontiac sedan and drove out of the fair parking lot. Minutes later, he crashed into a Ford Explorer in the intersection of Spring and 16thstreets. Officers responded to the scene of the crash and found the SUV in the middle of the intersection with major front-end damage and the sedan parked in a nearby Bank of America lot. 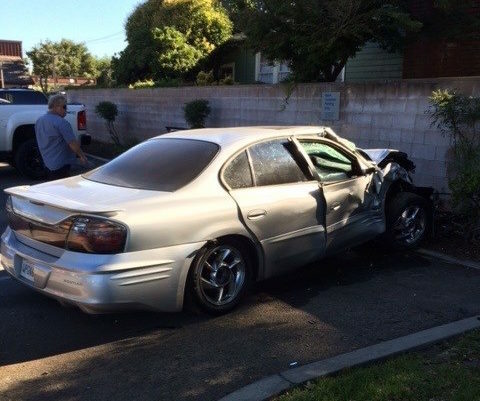 The Pontiac, too, appeared to have major front-end damage. The driver of the Ford Explorer suffered moderate leg injuries and was transported in an ambulance to Twin Cities Community Hospital. Officers arrested the suspect on charges of auto theft and DUI. Police say alcohol was a factor into the crash. An investigation into the incident is ongoing. Officials have yet to release the identity of the suspect.